The bride and groom and their moms posing with the "guests" and dancers. Since my little urchin boy was in WGM with Hwang Bo, I've been following other couples even after Hyun Joong left the show ^^ My faves [and the only ones I watched] are the Goguma Couple, the Dog Poopie couple, the Brave couple and the Woojung couple [molkang molkang he he he...]. And now....the Woojung couple...are in my country. TARA's Eun Jung and Singer and actor Lee Jang Woo just left Lombok [where they filmed a segment of WGM] for Bali...and from Bali, they'll go back to Korea. 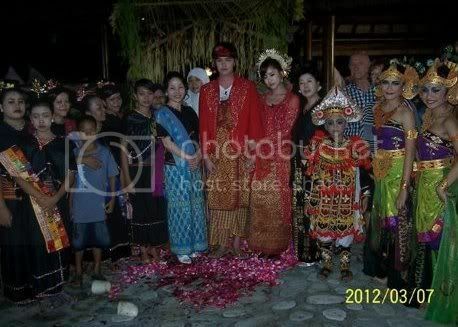 In Lombok they held [a make-up] traditional wedding, wearing traditional wedding clothes ....wow....I sooo have to blog this LOL !! Before my pix spam I'd like to put the Photo Credits : Thank you sooo much to Aira Sekar Arum [ for the updates, infos and pics] and Woojung's plus Tara's fans in Lombok and all Indonesia ^^ also to allkpop.com, woojungislove.com, ennaemesayu.wordpress.com,detik.com,taraworld.net,and hallyukvcwordpress.com . Eun Jung in red Kebaya....and red and gold Saroong...Jang Woo in matching Saroong. The Saroongs the couples and their mothers are wearing are traditional woven cloths, the ones woven with gold threads like these are expensive and sometimes a bit heavy and stiff. They are worn for special events and ceremonies. 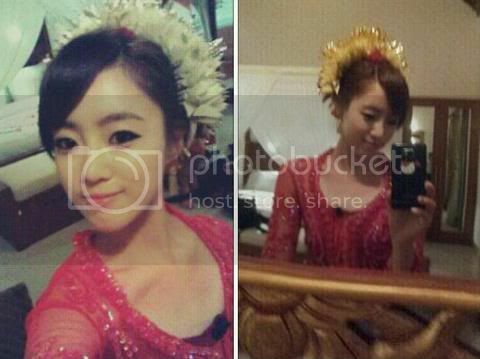 The ornamental headdress Eun Jung is wearing is similar to a Balinese headdress for the bride....Lombok and Bali culture share many similarities. Jang Woo's supposed to be bare chested under his clothes...but I think the clothes are a bit prickly and itchy when you get hot wearing it....hehe....so to have the t-shirt next to his skin is better. Wow...I've never been to Lombok....tho it's near Kupang [just the next island...so to speaK ^^], but it looks beautiful and not as crowded as Bali. They stayed in Hotel Sheraton,Senggigi. They went to Bukit Nipah, Pantai Malimbu 2, Gili Air and Sukarara village to shoot. 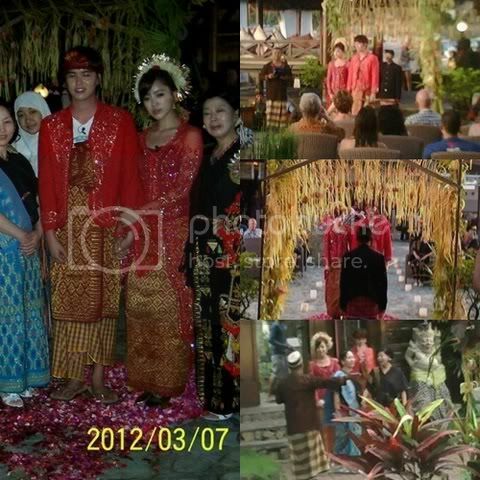 I guess above are the pixs of Woojung couple in Bukit Nipah ?? Coz "Bukit" means "Hill" in my language and you could see them walking up a hill there. The view must have been worthed to see....after being tired from trudging up and up...oww poor moms ! Hope she bought lotsa soveniers for Tara members and her family !! Photo Credits : As labeled and mentioned above.